labor supply have access to more prospects. As a result of this, these agencies are a better forest to help organizations find the most suitable candidate for filling up vacancies. HR departments within organizations are not known to maintain databases of rejected candidates or candidates who may have declined a job offer due to lower remuneration. Similarly, HR departments will certainly not have the time of the resources to follow up with candidates to maintain updated contact information. Whereas, recruitment agencies make it a point to maintain updated databases about suitable candidates and the latest contact information. Consequently, these agencies are in a position to quickly get in touch with this candidate and roll out the best offers in time. Faster recruitment process Agencies that specialize in UAE labor supply, offer organizations the benefit of the fastest recruitment process. This is because of the availability of dedicated resources and streamlined processes. The HR department in an organization generally looks after various HR functions. It may, therefore, be difficult for the HR department to devote sufficient time to quickly carry out a shortlisting and recruitment activity. Specialist recruitment agencies have the advantage of quickly carrying out a shortlisting and recruitment activity by virtue of being in possession of all the necessary information and the latest applicant tracking software. UAE labor supply will be fully aware of all the latest benchmark remuneration and perks offered by organizations. This will help HR departments to make the most suitable offer for candidates. This will help attract and retain the best talent. This will also help organizations to save costs - there are instances of many organizations paying more than benchmarked standards to candidates because of a lack of awareness about appropriate payments. Recruitment agencies assist organizations in handling all aspects of the hiring process including recommendations about suitable payment standards for candidates based on market intelligence. 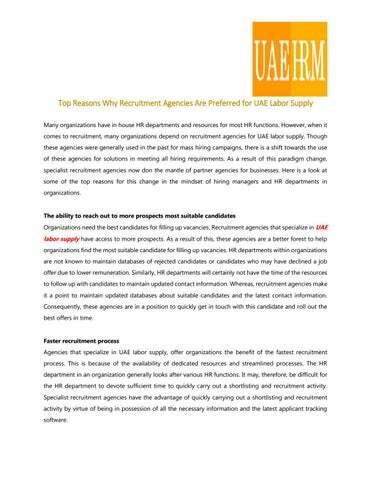 UAEHRM describes top reasons why recruitment agencies are preferred for UAE labor supply. 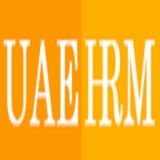 Email: info@uaehrm.com!